Well it had to happen, and congratulations to Muscat Daily for covering it (coincidentally, when are they ever going to get around to making a website?) on their front page today. Tourist Visit Visa's have been hiked from RO 6 to RO 20. 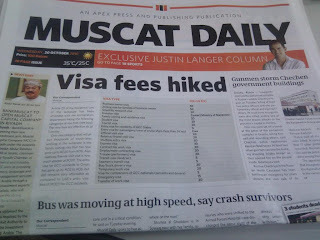 A pretty sharp increase in the visa charge, but in line with the charges being levied by the UAE. Of course those carrying passports on the magic list don't have to pay the visa charges in the UAE, but will now have to pay RO 20 instead of previously RO 6 when coming to Oman now. It'd be interesting to see the revenues generated from the visa fee. What do you lot think about the increase in fees? Uae doesn't even cost that much BTW. They don't charge you that AT ALL to be a tourist. Can we charge it only to Emiratis since they charge stupid taxes to Omanis over the border? I think that would be fair. I am pouting and throwing a tantrum like a child, sorry! I hate it also, how are we supposed to promote tourism when it costs people so much to visit given it is only for 1 month and not like the 3 months many other countries (non-GCC) offer tourists? If the UK charges the Chinese 20 pounds to enter, then China charges the equivalent in Yuan. America costs the most! BigManInOman: Oooh. I love that. Well, maybe not with my passport, but the justice of it appeals greatly. This is a crazy change and makes Oman much more expensive to visit for a family of four compared to Dubai. OMR 20 = $40, 4 people = $160 on top of the already 'not cheap' costs of visiting Oman. Oman is not a cheap country to visit anyway.... Real tourists who will be able to afford accommodation, eating out, etc., will certainly be able to afford the tourist visa too... As to revenues, tourism reveneues aren't so big even for big tourist countries such as Greece. will have an effect, as an illustration cruise ships passengers frequently didnt get off with earlier arrival fees - check hotel figures next year - and as yet its not on ROP Web Site ! "To encourage cruise traffic, the authorities have decided not to charge anything for entry visas for passengers and crew of passenger ships that anchor at Omani ports for less than 24 hours." 20 OMR is a little steep for a visa. I know i wouldn't like to pay that much if I was coming to Oman. and Why is everything in Oman going up double if not triple? How does that promote tourism? Visas have nearly quadrupled, PDO membership has doubled, Rent has doubled, cost of food had nearly doubled. 2. 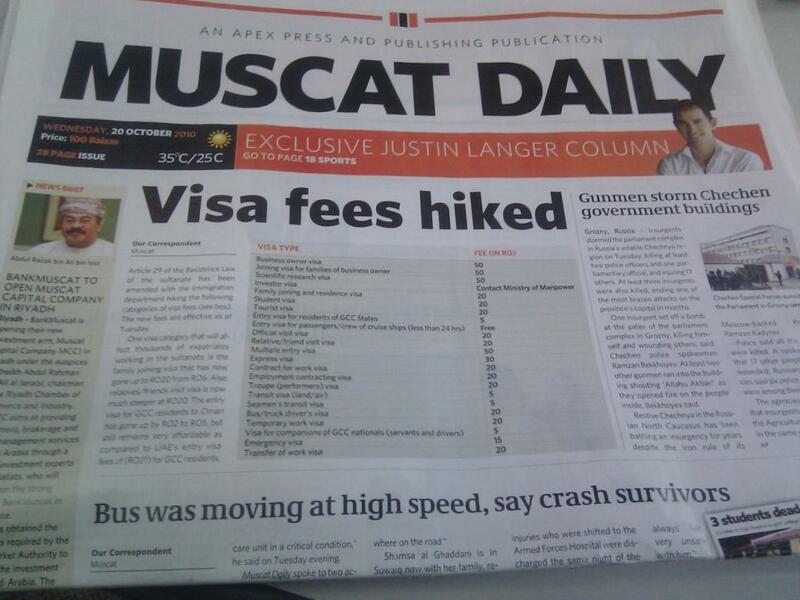 Like China does, charge different countries the same rates it costs for a visa for Omani Nationals. 3. Visa rates can depend on the duration of stay. Less cost for shorter stays. Thanks Muscat Daily if you had not posted it I would not have known. I went to Dubai over the weekend, when returning and having to pay the new price for the Visit Visa I was prepared, everyone else buying Visas had no idea of the cost hike. Of course being Oman there was no notice informing you of the changes. Gulf News reported it yesterday but said that there had been no official announcement. What a typical Omani farce! Considering it is / was going to be my first visit to Oman (still planning/considering) but nothing booked yet,this sudden jump in the Tourist Visa price right in the middle of already seeing that when taking into account 4wd hire and other things,this would be my most costly travel to date, 6 to 20 just isn't welcome. Especially as it's only single entry. Being pinned at OMR6 for how many years? the £9 or so was in some ways a little mercy offset to the other costs of visiting. Not now. £32 is just a further slap. Oman must 'truly' be wishing to only attract a certain 'quality' of foreign tourist (like Bhutan's policy about tourism) like wealthy Business men and Royalty. Thank you for visiting my blog. Yes, there is no need for NOC and they are very accommodating and helpful, just be sure that your documents and requirements are complete. Enjoy your tour!